What the heck is an Amiibo? Amiibo figures are basically Nintendo’s answer to Disney Infinity and Skylanders figures. You buy a figure of your favourite Nintendo character, you touch the figure to the reader and the figure does something in your video game. The Link figure above can be used in Mario Kart to unlock a new costume for your character, in Hyrule Warriors to get extra weapons and in Smash Bros. Wii U, he allows me to fight with or against a CPU fighter that levels up the more you fight against it. I was dubious about Amiibo figures right up to launch day, I really did not see the point of them. Sure it’s nice to be able to pick up some cheap-ish official Nintendo figurines that have a uniform design to them, but I was not really sure if I was going to get anything out of their video game functionality. Turns out I was pretty wrong. I primarily play Smash Bros. as a single player game. I work my way through the challenges, I play through classic mode and I do all the special types of fights in the game. I collect trophies, I practice my skills in things like the Home Run Contest, but most of my time is devoted to the traditional Smash mode. I load up Smash mode, I set up a 1:1 match with a level 9 enemy (the highest available level of computer controlled enemy) and practice fighting against the computer ready for the next time I play against local friends. The problem is that level 9 CPU characters are a little under my skill range at this point. As someone who has played the series since the early 2000’s, I’m now good enough to beat level 9 enemies without too much difficulty, but not yet up to the level that some of my friends in the competitive scene are up to. I needed something to push me to play Smash Bros better on a regular basis. In steps LinKBuzz. 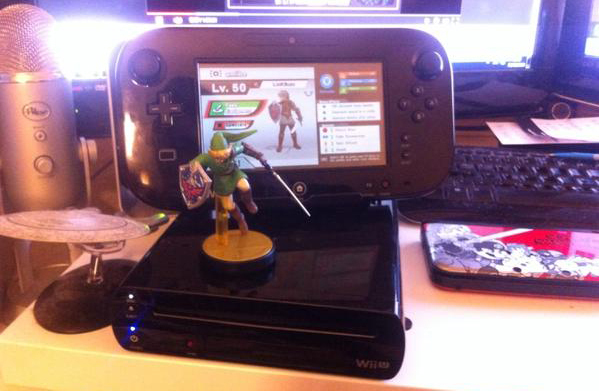 My Link Amiibo started off as less than useless. At level 1, it would walk toward me and wait to be hit by charged attacks, making no effort to return to the battle when knocked away. Still, it improved round by round. By level 15 LinKBuzz had cottoned onto the fact I have a preference to heavy smashes and was playing much more defensively. He dodged and blocked with a reasonable degree of speed, requiring me to practice dashing in and performing fast paced attacks more often. By level 30 he had picked up on that too and was getting good at timing smash attacks to hit me just as I committed to a dash and before I had time to cancel my attack pattern. By level 40 I was struggling to beat him with anything but the characters I considered myself best with. By level 45 I couldn’t consistently beat him with any of my characters. By level 50, the level cap, he posed a real challenge for me. In a three stock smash I’m lucky if I get even one stock from him before dying. He’s the high level player I had been looking for to practice with. As someone with minimal local friends and poor internet, he had quickly become the challenge I needed to improve as a player. At first I did not get the appeal of Amiibo figurines for Smash Bros. on Wii U. Three days later I entirely understand what they offer me as a player. Needless to say, I’ll be picking a couple more of these up down the line. Enjoy my work? Consider backing me on Patreon at Patreon.com/LauraKBuzz.